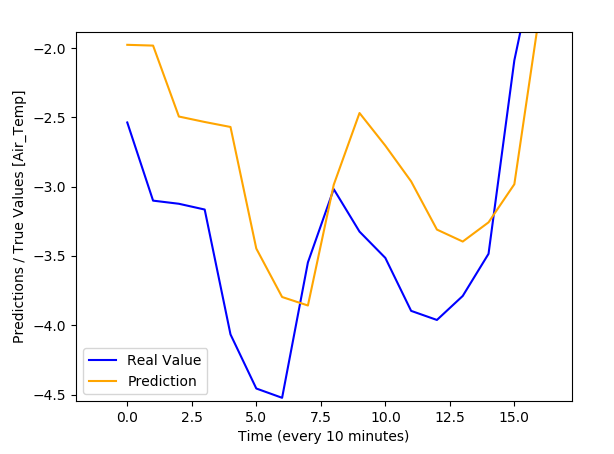 I'm trying to use the Tensorflow regression tutorial (with Keras) to do some regression on a time series with a couple of inputs. I will provide code if asked so. My data consists of samples of every 10 minutes and I thought using these inputs I can predict the Air Temperature using this type of (feed forward) neural network as in the tutorial. I am training the network on a 20 days worth of data and trying to predict the next 10 unseen days but my output looks shifted to the right by 1 and I cannot figure out why. I have even tried predicting my train data and I get the same story. So overall the prediction is not too bad but it appears to be shifted for some reasons. Ok so now I understand that this is reasonable using a simple NN so now I'm trying a LSTM NN and still I get this shift. What's the best way to go about this then? Not the answer you're looking for? Browse other questions tagged machine-learning time-series tensorflow keras or ask your own question. How to get the same output on each training iteration of neural network?